Education represents both consumption and investment. Education is valued for its immediate as well as for its future benefits. Since the distribution of educational investment affects future income distribution, equity plays an important role in educational investment decisions. Different societies give different weight to the objectives of efficiency and equity in analyzing educational investment. In general, centrally planned economies placed a higher weight on equity grounds in defining their educational policy investment than capitalist economies. This paper follows up and complements my previous publications related to sources of economic growth in Cuba (Madrid-Aris, 1997, 1998) in the sense that the growth accounting or sources of growth analysis is extended by creating a labor quality index to determine the contribution of education to economic growth. This paper has two goals. The first one is to provide a very brief descriptive analysis of the historical pattern of factor accumulation (physical investment and human capital creation), social investment, and human capital creation in Cuba. The second is to determine education’s contribution to economic growth. The paper is organized as follows. The first section provides a brief review of the historical patterns of Cuban growth, factor accumulation, and human capital for the period 1962-1988. The second section contains a brief review of different methodologies normally used to estimate education’s contribution to economic growth. The next section contains the estimation of education’s contribution to economic growth using Denison-type growth accounting methodology. The final section contains the conclusions. Table 1 presents a summary of Cuba’s main macroeconomic indicators and of Soviet assistance received by Cuba during the period 1960-1988. Cuba’s gross material product (GMP)3 grew at an average annual rate of 4.4% and per capita income increased at an average rate of 3.2% during this period. Cuba greatly increased the rate of investment, which went from 15% of GMP in 1960 to 30% in 1988. Data from Table 1 shows that between 1960 and 1964, there was no increase in income per capita. Meanwhile, during the period 1965-1988 income per capita increased at a considerable rate. Table 1 also shows that Soviet assistance increased considerably over this time. During the period 1960-64, Soviet assistance was on average only 7% of GMP, but it increased to a level of 33% of GMP for the period 1980- 1984. The amount of Soviet assistance was larger than the investments realized by the Cuban government for the period 1980-1984. In other words, during this period, it could be assumed that most of the investments realized by the Cuban government were realized by using capital received from Soviet assistance.4 Therefore, it could be inferred that the Cuban economy was losing its saving capacity. Note that the highest rate of economic growth (10%) was achieved in the period 1970-1974. Ironically, during this period the Cuban investment rate was low (17%) and even decreased from 19% to 17%. Additionally, the lowest rate of economic growth (1.3%) was during the period 1985-1988, when the highest rate of investment (31%) was observed. Looking at these figures, it seems that the Cuban economy was not able to absorb in an efficient way such a high level of investment.5 If the rate of investment exceeds the country’s technical, human and institutional capacity to allocate it in an efficient way, most of the investment goes to poorly managed projects. Hence, investment is not very productive and depreciates. In sum, it can be concluded that during the 1980s, investment was not allocated as efficiently as during the 1970s. Table 2 shows that social investment increased considerably over the period 1960-1987. In 1960, investment in education was only 3.2% of total national income and increased to a level of 13.1% in 1987. Investment in health represented only 2.0% of national income in 1960 and it increased to a level of 6.6% of national income by 1987. Table 3 contains data on enrollment per 1,000 habitants by educational levels in Cuba between 1958 and 1985. Cuba considerably increased the rate of enrollment during the period 1959-1988. The data show that human capital accumulation was quite rapid during the last 35 years. Without looking at economic variables, such as the amount invested in education and the return on human capital creation, it could be concluded that the Cuban government was successful in achieving a very high rate of enrollment during this period. As Table 4 shows, the share of those with only primary education in Cuba was large initially, but it decreased considerably between 1960 and 1986. In addition, there was a uniform increase in universityeducated workers, which will have an important effect on the calculation of the growth of the labor quality component. Table 5 shows the factors’ contribution to Cuban economic growth for the period 1963-1998, estimated without considering quality adjustment factor for the labor force. Previous tables show that for the agricultural sector, the average total factor productivity (TFP) growth is negative (-1.5%), and the contribution of TFP to output is negative (-56%) during the period of 1963- 1988. In the industrial sector, at least the average TFP growth is positive, but it was moderate (0.6%), and its contribution to economic growth was very low (12%). In sum, the Cuban government’s interventionist policy during 1975-1988 was accompanied by very low TFP performance. Previous results show that the industrial sector, which had a lower rate of investment, had the higher TFP growth and contribution to economic growth. TFP analysis results show that Cuba’s growth during 1963-1988 was almost entirely the result of capital accumulation rather than productivity gains. Decreasing TFP growth through the 1970s and 1980s, with increasing amount of subsidies received from Soviet Union during the same period, seem to suggest that Soviet dependency created inefficiency in Cuba. This seems ironic, because Cuba’s centrally planned development strategy was oriented toward getting resources from agriculture to develop the industrial sector. But, in reality, agriculture was a big consumer of resources, especially capital, without any positive result. Results show that governmental creation of institutional mechanisms to deal with inefficiencies may not always be an efficient way to force technological change. Cuba’s decreasing TFP growth under factor accumulation is a confirmation of the low level of technical and allocative efficiency of a centrally planned system. Results from this research and other analyses of centrally planned economies (Nishimizu and Robinson, 1984) confirm that the lack of allocative and technical efficiency is a common pattern of centrally planned economies as a result of lack of competition and incentives. The concept of investment in human capital and its relationship with productivity and economic growth dates back to the time of Adam Smith and the early classical economists. The empirical literature on education’s contribution to economic growth began in 1960. This was mainly triggered by the need for understanding the role of education in economic growth. The most often cited works in this field are Schultz (1961), Denison (1962, 1967), Psacharopoulos (1972) and Nadiri (1972). By the 1980s, there was renewed interest in this field. Thus, in this period the most influential works are those developed by Hicks (1980), Wheeler (1980), and Psacharopoulus (1984). With respect to methodologies to estimate education’s contribution to economic growth, some researchers have used growth accounting or productivity indexes (Denison, 1967; Selowsky, 1969), production functions (Grichiles, 1970), and other growth equations (Harberger and Selowsky, 1966). Denison and Schultz were the pioneers in measuring the contribution of education to economic growth. While different methodologies have been used to estimate education’s contribution to economic growth, the two most commonly used7 are: (1) the labor quality adjustment growth accounting, or Denisontype of growth accounting (Denison, 1967); and (2) the rate of return to human capital (Schultz-type of growth accounting). With respect to the specification of the education variables, the number of years of schooling of the labor force in relation to the wage differentials of the labor force by different levels of education is frequently used (Denison), or the amount of capital invested in education in conjunction with the rate of return on that capital (Schultz). In equation (2), the index s represent the different schooling levels of the labor force and W represents the average wage of the educational category. Denison (1967) estimated that 23% of the rate of growth of output in the United States between 1930 and 1960 was due to increases in education of labor force. Denison also estimated that the corresponding share 1950-1962 was 15%. It is important to note that Denison-type growth accounting, as commonly applied without considering the maintenance component9 of a growing labor force, could result in an underestimation of the contribution of education to economic growth (Selowsky, 1969). Selowsky (1969), using a Denison type of growth accounting considering the maintenance component, determined that education’s contribution to economic growth in the United States for the period 1940-1965 was 21%, in Mexico approximately 11% and in Chile approximately 24%. Where Kedu is the educational capital stock in the economy and r is the rate of return on the educational capital. Thus, the product r*Kedu, is the measure of the educational factor of production that contributes to output. Thus, the Schultz-type calculation of the contribution of education to economic growth is made by estimating the factor rentals (rate of return to human capital times educational investment). The difficulty of this approach is that it requires the estimation of the stock of educational capital in the economy and the rate of return on that capital. Obviously, the estimation of these two variables is a very large task. In most cases it is impossible to estimate them as result of the lack of data, especially for less developed countries (LDCs). It is known that growth accounting and residuals are not a good tool for explaining the process of economic growth as result of the exogenity of technical progress. The important issue is to determine what are the variables that could explain the residuals. Although the residuals approach lost ground, especially with the development of the new growth theory, economists have not yet agreed on what is the proper way to measure the contribution of education to economic growth. For the purpose of estimating education’s contribution to economic growth in Cuba, the traditional Denison-type method of calculation will be applied. In equation (6), the index i represents the different years of schooling of the labor force or educational level. In our specific case, the index i represents the educational level attained by the labor force. For the purpose of estimating the index of the quality of labor force, each component of labor corresponds to a well-defined educational category (primary, secondary and university) as shown in Table 4. In other words, it is assumed that education is one of the most important factors determining labor income. The educational component could be defined in a way that covers formal schooling and informal education (e.g., on the job training). However, only formal education is considered in our analysis. It can be argued that growth accounting implicitly assumes perfect competition of labor markets, i.e., that the marginal product of labor equals wages. If labor markets are not competitive, as is the case in Cuba, 12 then relative wages across different levels of education are not necessarily a good measure of the relative productivity at different level of education of workers, unless the government sets the wages according to some productivity rule. If the wages are not a reliable measure of productivity, it may be preferable to measure the effect of education on physical measure of output, rather than using wage differentials. Another alternative is to use shadow wage rates, instead of actual wage rates, to estimate the labor quality index for the growth accounting estimation. In the analysis presented here, a sensitivity analysis is conducted using shadow wage rates from Brazil. Table 6 shows the relative wages by level of education in Cuba and other Latin American countries. Computing the labor quality component requires the data on labor force composition presented in Table 4 as well as on relative wages by level of education (Table 6). The quality of the labor force is due to education and is obtained by multiplying the rate of change of different educational categories or change in the labor composition by the relative wage of that category. Normally, earnings differentials have been adjusted by a common factor that ranges from 0.4 to 0.6. This adjustment tries to reflect that only a small part of the higher income should be attributed to schooling, the rest being due to others socioeconomic factors. In our case, no adjustment factor has been considered. In many cases, when this methodology is applied to LDCs, there is only one year of wage earning differentials or relative wages by categories (data presented in Table 6). One way to solve this problem is simply to use these one-year figures for all other years. This has been the approach used in all the country studies in which such information on relative wages is missing (Denison, 1967; Selowsky, 1969; Elias, 1992). Thus, using the data from Table 4 and Table 6, three different indexes for rate of change in quality of the labor force have been estimated (Table 7). As shown in Table 7, labor quality indexes using shadow wage differential from Colombia and Brazil have been estimated for comparative purposes. Using shadow wages from Colombia, the labor quality index estimated is lower than the one using the Cuban wages. Applying the factor estimated with the Colombian wages to Cuba, the contribution of education to economic growth will be lower than using the index based on Cuban wages. Hence, the contribution of education to growth will be estimated with the Cuban index and the index estimated using shadow wages from Brazil. The annual growth rate of the labor quality index due to education estimated increases over time until 1980 as a result of changes favoring the groups with higher relative wages (university graduates). The rate of growth of the Cuban quality index increases from 0.37% for 1963-1970 to 1.16% for 1970-1980, then it decreases to 0.83% for the period 1980-1988. Table 8 shows the contribution of education to economic growth estimated for the all productive sectors as well as for the agricultural and industrial sectors. Estimated figures presented in Table 8 assume that the quality of labor has increased at the sectoral level at the same rate as for the overall economy. The percentage contribution varies in part because of the different growth rates of output in the different periods for the different sectors (see Table 1). However, the main characteristic is the rising trend of this contribution. The important feature of these increases with regard to the education’s contribution to economic growth over the years is the increased index of the quality of the labor force (ΔQ/Q) complemented with the decreasing TFP growth. The increase in the rate of growth of the quality factor is mainly due to the rate of acceleration of the number of workers with a high level of education as a percentage of the total labor force (see Table 4). Obviously, this acceleration can not be expected in the future since most of the illiteracy has been eliminated, as Cuba has already achieved a very high rate of primary and secondary education. Our research shows that education’s contribution to Cuban economic growth overall has increased over the years from 1963 to 1988. The increases in education’s contribution to economic growth over the years resulted from the increased index of the quality of the labor force (ΔQ/Q) due to a more educated labor force and the decrease of TFP growth. The highest contribution of education to economic growth can be found in the agricultural sector (11.4%). This high contribution is due to the low overall productivity of this sector (see Table 5). The lowest contribution of education to economic growth is in industrial sector (5.7%), since this sector has grown based on more productivity gains than on labor gains. In other words, due to the assumption of neutrality of technical progress (exogenity) common in the growth accounting production function, the higher the technological change, the lower the expected contribution of education to economic growth. 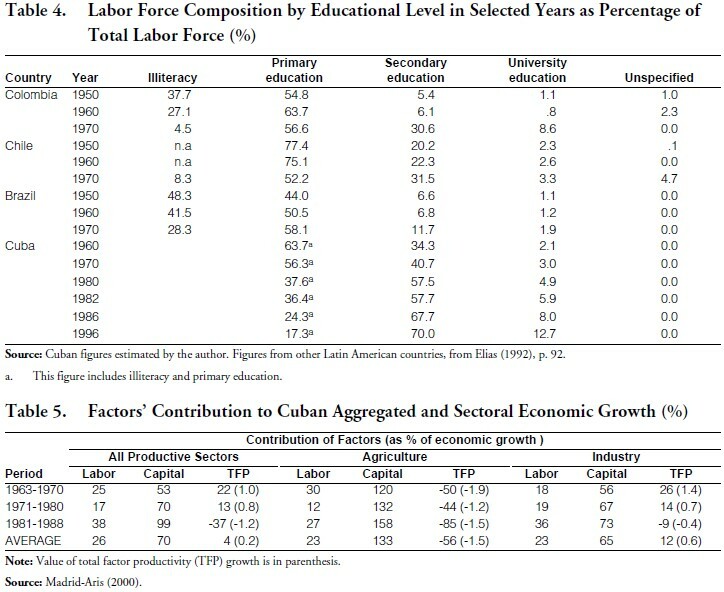 In general, education’s contribution to economic growth in Cuba can be considered low compared with other studies applied to less developed countries (Selowsky, 1969). This low level of contribution can be explained based on factor contributions to growth (Table 5), which show that Cuba’s growth during 1963-1988 was almost entirely the result of capital accumulation — which contributed 70% to economic growth — rather than productivity and labor gains. 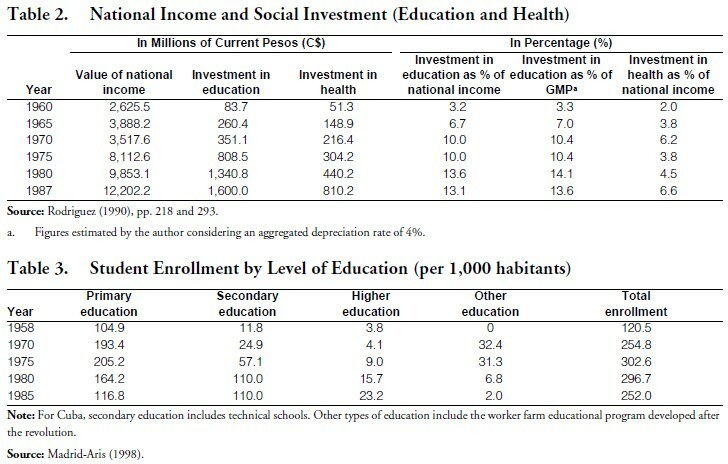 The low contribution of education to Cuban economic growth estimated from the simple empirical work conducted for this paper, complemented with the investment pattern on education (see Table 2), seem to suggest that the educational resource allocation policies adopted by Cuba’s centrally planned system seemed to have been aimed more at equity goals rather than efficiency goals. 1. I would like to express my deepest appreciation to Rodrigo García for his helpful research assistance. The views expressed, opinions and conclusions reached in this paper are those of the author, and do not necessarily reflect those of the institutions with which the author is affiliated. 2. For an excellent review of international rates of return to education, see Psacharopoulus (1972, 1985, 1994). 3. The Cuban accounting system is different from the western concept of Gross National Product (GNP). Cuba uses the Soviet system of Global Social Product (GSP) and Gross Material Product (GMP), which is also called “gross product.” For further explanation of the Cuban national income accounting system, see Brundenius (1984), pp. 19-40, Mesa-Lago and Pérez-López (1985). 4. Note that in a centrally planned economy like Cuba, investment is mainly realized by the government since there are no opportunities for private enterprises or for private investment. Therefore, private income is spent mostly in consumption. 5. Miguel Figueras, the former Director of Planning of the Cuban Ministry of Industry, supports this view. For further details, see Figueras (1994). 6. Human capital investment is a concept widely used by economists, meaning the process of improving the quality of the labor force. Thus, human capital is referred to as the level of education of the labor force. This improvement of the labor force quality is basically achieved by education and training (Becker, 1963). 7. For a more detailed review of these two methodologies, see Psacharopoulos (1973), pp. 111-118. Yt = A(t) f (Kt ,Lt ) 8. For an empirical application to Latin American countries, see Elias (1992), pp. 71-99. 9. Maintenance component is the effort entailed in maintaining constant the relative distribution of the labor force by years of schooling. For further details, see Selowsky (1969). 10. For further details, see Schultz (1963), Psacharopoulus and Hinchliffe (1973, pp. 20-34) Yt = f (Kt , Lt , r *Kedu) 11. If there is no change in the level of education of the labor force, the rate of change of the quality of the labor force will be zero. If there are changes in favor of the groups with higher relative wages (university graduates), the quality of the labor will increase. 12. In Cuba wages are set by central planners instead of define by labor market competitive forces.